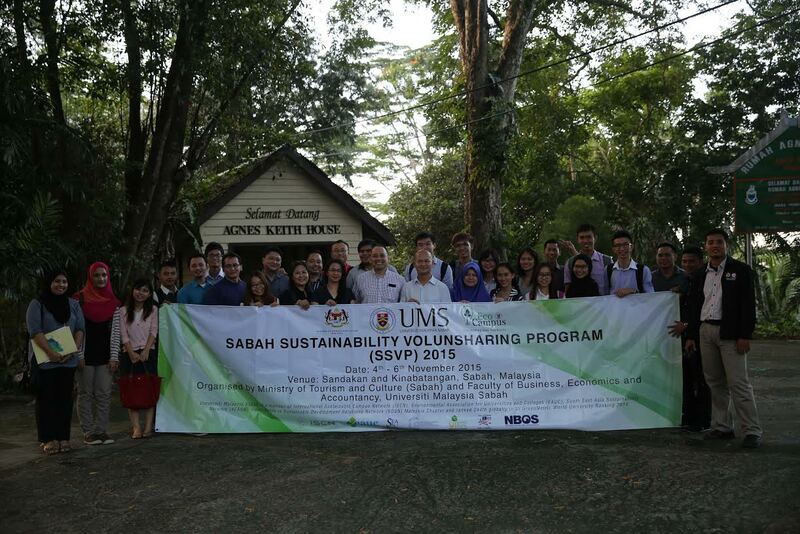 WEDNESDAY, 25 NOVEMBER – The Faculty of Business, Economics and Accounting (FPEP) in collaboration with the Ministry of Tourism and Culture (Sabah) recently organised the Sabah Sustainability Volunsharing Programme 2015. The four-day activity brought participants to explore Kinabatangan and Sandakan that kept many of their own history and tourist attractions. According to the programme director who is also a Senior Lecturer of FPEP, Awangku Hassanal Bahar Pengiran Bagul, the programme was participated by 17 undergrad and four postgrad students, accompanied by four lecturers. “Among some of the activities held were Heritage Trails around Sandakan township with a visit to Agnes Ketih House, a historic mansion that still retain its British colonial designs,” he explained when contacted. He added that the participants were also exposed to the development of tourism and sustainable agriculture through a seminar which was officiated by the Dean of the Faculty of Sustainable Agriculture, Professor Dr. Wan Mohammad Wan Othman.